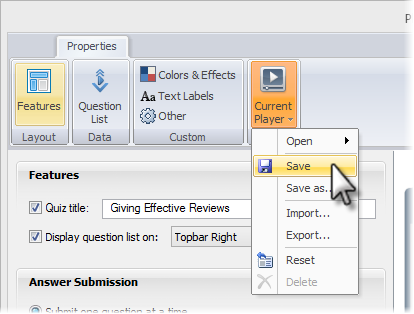 Articulate Quizmaker lets you choose which options and controls are included on your quiz player. To customize your player, go to the Home tab on the Quizmaker ribbon, and click Player. When the Player Properties window appears, the Features button will already be selected, and you can begin choosing your preferences. As you make changes to the options on the left side of the window, keep an eye on the Preview area on the right side of the window. It'll change to reflect your choices. When the Quiz title box is marked, your quiz title appears in the upper left corner of the player. If you'd prefer not to display a title on your player, uncheck the Quiz title box. The quiz title defaults to the name of your project file, but you can change it. Just type the title you want in the field provided. It'll change the title on the player, but it won't change the name of your project file. Tip: You can also define your quiz title in Quiz Properties. If you want to control the order in which learners view your quiz slides, you may want to consider turning off the question list. Or, enable the question list, and set the navigation to Restricted or Locked. Submit one question at a time: Choose this option to let learners submit their answers on a question-by-question basis. When they submit an answer, they’ll see any question-specific feedback you've added to that question, then they’ll move on to the next question. They won’t be able to go back and change answers (though they'll be able to review the questions and their answers if you've enabled the question list—see above). This approach is great if you want to show feedback after each question or if you want to branch learners to specific places in your quiz based on their responses. Submit all at once: Choose this option to let learners wait to submit their answers until they’re completely finished with the quiz. They can move back and forth among the questions, and they can even change their answers at any time until they submit them at the end of the quiz. Quizmaker won’t display feedback after questions, since choices aren't evaluated till they're submitted. This approach works well if you don’t need to show question-specific feedback or use branching. It's also a good option if you don’t want the learner to know how they did on the quiz until the end. If you choose Submit all at once, you can also let learners submit their answers without finishing the quiz by marking the box to Allow user to finish without answering all questions. By default, Quizmaker requires learners to scroll to the end of lengthy questions before submitting answers, but you can turn this feature off by unchecking the box to Require user to scroll to bottom on longer questions. Seekbar: Mark this box to include a seekbar at the bottom of the player. The seekbar will include play/pause and rewind buttons. What About Prev, Next, and Submit Buttons? You might have noticed that the Controls listed on the Player Properties window don't include slide navigation controls, such as Prev (previous), Next, and Submit buttons. These buttons are included by default with your quiz slides. If you'd like to change the wording used for these buttons, see this tutorial. If you click OK on the Player Properties window and save your quiz, Quizmaker saves your player customizations within the quiz file. It's a good practice, though, to save your player separately, so you can apply the same player customizations to other quizzes. To save your player, click the Current Player button and choose Save. Enter a name for the player if you're prompted, and click OK.
For details about using the Current Player options, see Saving Your Player or Switching to a Different One.